A brilliantly autumnal dish from the Aussie cook and MasterChef presenter. Mushrooms come in myriad shapes, sizes, colours and flavours, but all have an affinity with smoky bacon, white wine and fresh, vibrant parsley. A quick cooking is all that is required for a great breakfast, lunch or simple supper. Heat the oil in a large frying pan, add the pancetta and fry over a high heat until golden brown. Turn the heat down to medium, add the garlic and soften, without colouring, for about 2 minutes. Increase the heat again and add the butter to the pan. Once it starts to sizzle and turn golden, add the mushrooms and stir, making sure that they are coated with the pancetta and garlic. Allow the mushrooms to brown slightly, then add the wine and reduce quickly until there is only a small amount of liquid remaining. Season and stir in the parsley. Meanwhile, soft-boil the eggs. Place in a saucepan, cover with boiling water and simmer for 5 minutes. Drain, run under cold water until cool, then set aside to rest for 5 minutes before removing the shells. Toast the bread under a grill or on a hot griddle pan until lightly charred. 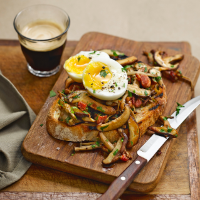 Spread with butter, top with the mushrooms and serve immediately with a soft-boiled egg on top.